In addition to the pipe work a key component is the Underfloor Heating manifold and the associated controls. At Emmeti we offer an extensive range of high quality manifolds and controls plus all pipe and accessories required to form a full UFH system solution. This section is T3 Controllers only. Type 3 (T3) controllers are for underfloor heating (UFH) systems only. They have a temperature controller and pump, to ensure that the water is at the correct temperature for the underfloor heating circuits, and there is sufficient flow for the greater length of pipe used. Emmeti have available many variations of stand-alone control groups, suitable for all different types of UFH applications; TM3 Mixing Unit, M3V Controllers, T3 Controllers and T2 UFH Heat Pump Group are fully pre-assembled single piece ‘plug and play’ sets. Designed to provide both fixed and variable temperature solutions to suit Emmeti underfloor heating manifolds in 1” and 1¼” sizes. 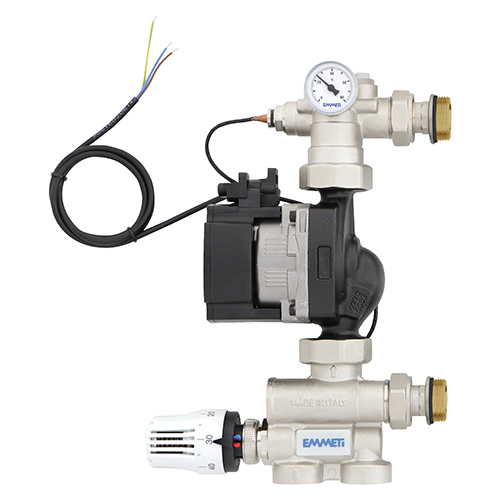 All circulating pumps included in our T3 UFH Control group range are ErP 2015 compliant. 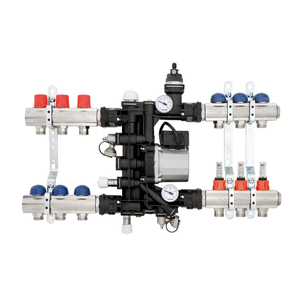 Our T3 UFH control groups includes temperature management, circulating pump, built-in temperature gauge, mounting bracket and swivel joints for connection to the manifold assembly. Mixing water to the desired temperature can be achieved either by using a thermostatic mixing valve to give a ‘fixed’ temperature or a motorised valve which can give either a ‘fixed’ or ‘variable’ temperature. We offer a solution, from a simple non-electrical temperature management option to a full weather compensated package. If a project calls for a mixed heating system, such as bathroom towel rails as well as underfloor heating throughout the property then the M3V Control Group is the ideal solution. The M3V Control Group is designed to work with both high temperature circuits (wall hung radiator circuits – 60-75oC) and low temperature circuits (underfloor heating pipe running at temperatures lower than 50°C). Made in high performance PPA resin, the M3V Control Group incorporates a circulating pump, built in differential pressure by-pass valves, automatic air vent, balancing valve and fill/drain valves. Designed to be used with Topway T2 manifolds for both underfloor and radiator heating applications combined. 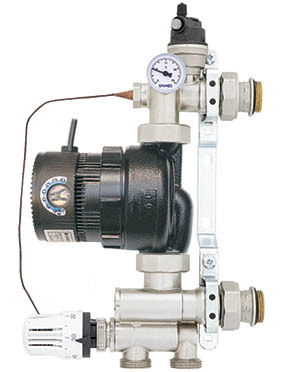 Two versions are available with either a fixed speed or variable speed pump. It is offered for use with both thermostatic fixed temperature and electronic variable temperature control when used with the RCE weather compensating controller and electronic actuator.